University of Washington alumnus Henry (On Man) Chan, ’14, is the first UW student or alum to receive the Schwarzman Scholarship. An extremely competitive scholarship, only 147 of the 2,887 candidates were selected to join this one-of-a kind program that focuses on developing the next generation of global leaders. Schwarzman Scholars will come from around the world to Tsinghua University in Beijing to immerse themselves in Chinese culture, business and language. At the end of the cross-cultural, year-long program, scholars will have developed an in-depth understanding of China and earned a master’s degree in global affairs. Chan’s bachelor’s degree is in business administration, finance. He was working for Deloitte Consulting when he first learned about the Schwarzman Scholarship — from an in-flight documentary while on a business trip. The opportunity to get a broader understanding of China’s business policy, diplomacy and tech sector alongside similarly-motivated scholars really appealed to Chan. Inspired and intimidated, he knew he had to apply. Chan grew up in Hong Kong and came to the U.S. for high school and college. He was involved in a range of activities within and beyond UW’s Foster School of Business. He served as president of the Hong Kong Student Association, was business development lead for AIESEC — an international, student-run organization that builds cultural understanding through a paid internship program — and participated in Husky Traders as a shareholder. He also sang in UW Chamber Singers, which he credits with instilling in him respect for meticulous practice. As president of the Hong Kong Student Association, he learned to problem solve and work with people from different cultures. AIESEC and Husky Traders brought opportunities for Chan to apply his business skills. 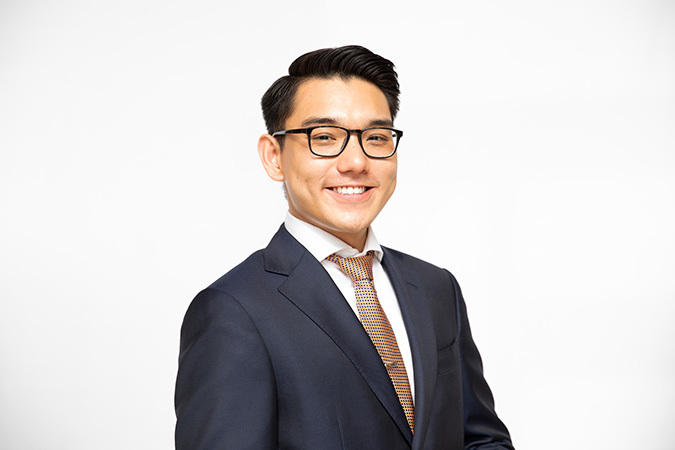 The culmination of these experiences helped Chan succeed in his Schwarzman application and current role as a management consultant at Deloitte Consulting. Moving forward, Chan wants to understand the impact technologies such as artificial intelligence and automation have on human work. He anticipates that China and the United States will be the world’s tech leaders. Through his work at Deloitte, he’s had a chance to spend time in Seattle and the Silicon Valley. Now, he’s eager to experience the nuances of China’s tech sector. He’s also anxious to learn more about politics and policy, disciplines which he believes will be deeply consequential in the future of human work. He’s confident that the Schwarzman Scholars program is the perfect program to build on his background and work toward his future goals. Have the courage to take a chance to do something. Someone told me these things are unpredictable. Don’t worry about the odds and just go for it. Don’t underestimate what the people around you can offer. Had I not mentioned my application to people, I wouldn’t have heard about the Japan visit with the admissions director. Thoughtful preparation does pay off. For me, that was a lot of practice before my interview. I focused on articulating my personal story and connecting it to why I wanted this scholarship. For you, it may be something else. Designed to inspire the next generation of global leaders, Schwarzman Scholars is the most significant program of its kind since the Rhodes Trust was founded in 1902. The Schwarzman Scholars Program is in its third year as a new institution at Tsinghua University in Beijing. The program’s focus is global leadership and draws students from China, the U.S. and the rest of the world. Over the course of the year, students will spend a quarter immersed in language: Mandarin for non-Chinese students; English for Chinese students. They’ll complete an intensive field study, where they will spend a week in communities throughout China, working with mentors from NGOs, academics and government; receive mentorship from prominent Chinese leaders; attend talks from high-profile speakers; and complete a practical training project, where they take on consulting-style projects. Scholars also have access to career services support to help them make the best of their time in Beijing, and receive ongoing support in the form of alumni events. The Schwarzman Scholars program is dedicated to building a strong alumni network, so that their students can continue to learn from and support one another. The Schwarzman Scholarship application process is supported by the Office of Merit Scholarships, Fellowships and Awards (OMSFA), a UAA program. OMSFA works with faculty, staff and students to identify and support promising students in developing the skills and personal insights necessary to become strong candidates for this and other prestigious awards.